The brakes on a semi-truck pulling a trailer full of sweet potatoes overheated and sparked a fire Tuesday night on Interstate 5 near Central Point, Oregon, causing flames to spread to the trailer and burn a sizeable hole in the side. The incident happened just north of exit 33 in the northbound lanes. The vehicle's unidentified male driver pulled over and was able to disconnect the trailer, according to Jackson County Fire District No. 3 spokeswoman Ashley Blakely. "[He] did everything he could to disconnect it and be safe." The trailer, registered to New Capital Roadways Ltd. of Abbotsford, British Columbia, was blazing by the time firefighters arrived. Video taken by Fire District 3 shows large flames waving on both sides of the trailer when fire crews pull up. Three engines from Jackson County Fire District No. 3 traveled to the scene. Firefighters had the fire out just after midnight, Blakely added. 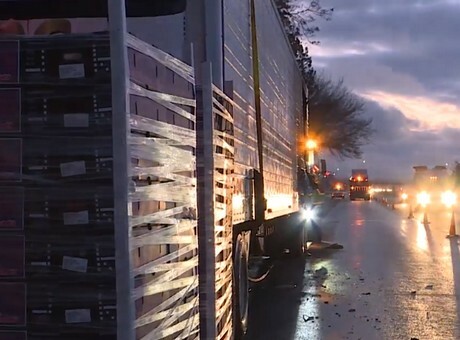 The Oregon State Police and the Oregon Department of Transportation responded to the scene, helping to put up cones and direct traffic while firefighters handled putting the fire out. According to ktvl.com¸ some of the potatoes burned in the fire, but multiple crates were salvaged.